CardMonkey's Paper Jungle: Hop, hop! 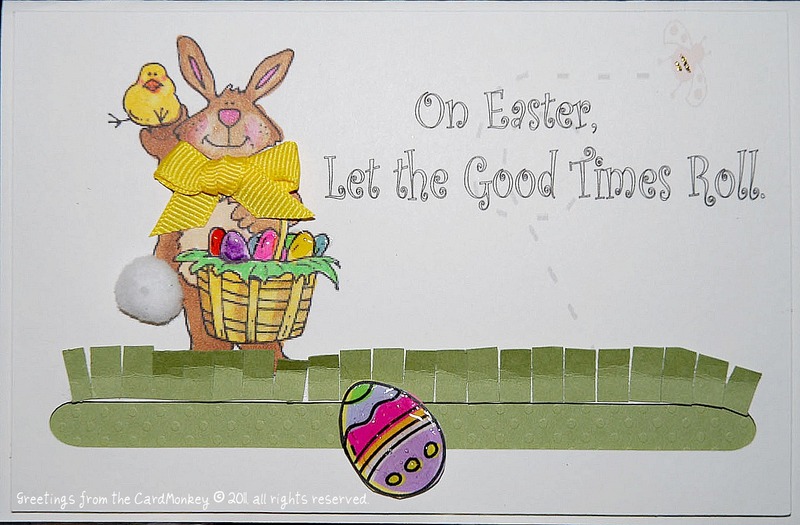 Time for the April Bunny Blog Hop! In honor of Easter we are all making a project with a bunny on it. I made an Egg Roll! I have made a template for the spinner card's cut. The template is printed on acetate in a variety of sizes, so you can just trace it with a pencil and then cut. The template, along with a kit to make a half-dozen of your own Egg Roll spinner cards, will be given to one lucky follower. Just be or become a CardMonkey follower and leave me a comment that includes a way to get in touch with you! I will allow "Randy" at Random.Org to chose a winner on April 6, so please get your comments posted in time. I hope you enjoyed yourself and maybe learned a thing or two along the way. In case you get lost, here is a list of all of your stops. Thank you Jacqueline for hosting this fabulous Bunny Hop! If you've finished this hop and want to visit another group of talented crafters, head on over to the other blog hop I'm in today. It's called "With the Rain Comes All Things Beautiful". It features spring/flowers projects, and it starts at www.scraps2treasures.blogspot.com. Egg Roll ~ I love it!!!! What a cute card! So glad I am in the hop with you!! Thanks so much for joining me on the hop – just hopping myself to see your project - an egg roll - how cute and original. hopping over! Love your blog. Leaving some Happy Friday hugs! Just love interactive cards. Great job on the spinner card! Super cute card. Happy Hopping!!! You are the "hoppin-est" person I've ever seen! Love the spinner card. Haven't tried one of these yet but want to. I've just got to come up with an idea for one. Just 'Hopping' by to wave *hi* to my Fellow Hop-Bloggers! Great card! I love egg rolls, but rolling eggs are fine too ;) TFS! Very cute card. TFS. Already a follower. You are so funny!! Cute idea!! Thanks for the video tut on the spinner card. So cute! I am following you now! Great work from a fellow blog hopper! Hey i enjoyed your card, i'm just going to have to make one of these soon, so much fun....TFS! I'm making my way around to look at all the great projects everyone has done...www.canadiancraftcorner.blogspot.com #19 on the list. OMGoodness your card is Adorable!!! I've never seen this technique before, thank you for doing a tutorial! Would love to know how you get the long cut covered though. I really want to try this, it's soo cute! Cute card! and great video! Love the action of the card. Looks like fun to take a chance at makeing one. What an adorable card! How clever of you to figure out how to make the egg roll! I have seen other kinds of spinner cards but not as cute as this one. Great job! Egg roll! What a neat and unique technique! Love it! what a unique card! love it! happy hopping and I am now a follower. Cool idea!! Thanks for sharing!! I am a new follower of yours! I hope you hop over to my blog and follow too:) Great project! Oh I love it "Egg Roll" that's jsut too cute!!!!! Your card is amazing!! I need to learn how to make these spinner cards ASAP lol! These would be perfect for kids. Love Your Blog...such great projects! Ooooo...an egg roll sounds good right now! lol Love your card Ellen! Just awesome Ellen!!! Very creative. Cute and looks easy enough for even me to make! What a great card! i am really having fun on this hop!